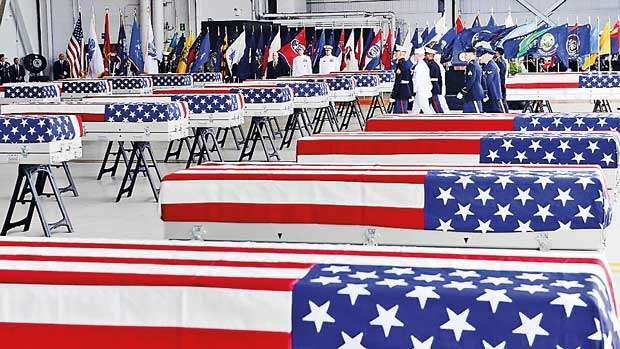 Dozens of cases believed to contain the remains of missing American soldiers who died during the Korean War have finally returned to US soil - as President Trump praised North Korea’s ‘kind’ Kim Jong-un for keeping his word to return them. In an emotional and solemn ceremony, Vice President Mike Pence welcomed the remains of the presumed casualties on Wednesday after they were flown from South Korea. American flags were draped over the 55 cases as they arrived in Hawaii and were escorted off an aircraft by military honor guards. ‘Some have called the Korean War the ‘forgotten war.’ But today, we prove these heroes were never forgotten,’ Pence said at the ceremony. Hours later, Trump took to Twitter to praise the ‘beautiful ceremony’ and to thank the North Korean leader for keeping his commitment after they reached an agreement during their recent summit.